Gorillas exclusively thrive in the dense tropical forests of Africa. Their distribution range is divided into distinct parts with 900km in between. The western and Eastern gorillas separated long time ago as a result of the occurrence of the last ice age that led to deterioration of the rainforest into few refugee areas.As a result savannah occupied the gap that was created by this division and it was not in any way ideal for gorillas thus maintaining their distinct groups in the two forest refugees. However, after the regeneration of rain forests in the area, these two groups of gorillas could only draw to River Ubanji and River Congo. As a result of this long time split, the eastern and lowland have developed gross differences not only in their genetic build but also in their external characteristics. Mountain Gorillas which are listed as critically endangered by the International Union for the Conservation of Nature (IUCN) only dwell in the massif of Virunga where 480 of them are distributed in the National Parks of Mgahinga in Uganda, Volcanoes in Rwanda and Virunga and Kahuzi Biega in Democratic Republic of Congo. 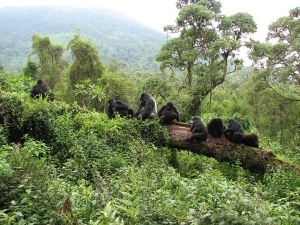 The other 400 dwell in the prehistoric Bwindi impenetrable forest Uganda re-known for gorilla trekking.